What’s the difference between cold and allergy symptoms? 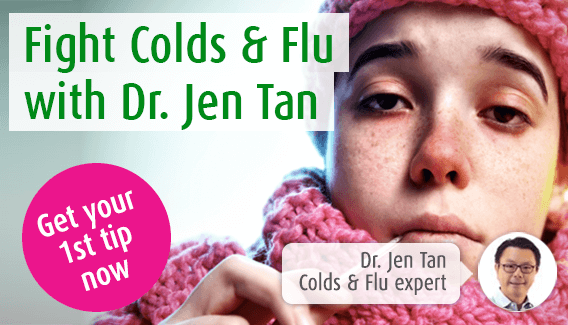 home > health > immune system > whats the difference between cold and allergy symptoms? Feeling the onset of sniffles, sneezes and a sore throat but unsure what’s causing your symptoms? Here I discuss the difference between cold and allergy symptoms to help you better understand what’s behind the problem. As I am sure you are aware, the common cold occurs when you become infected with a virus. This puts your immune system in defense mode as it tries to fight the virus off. Although this is your body’s way of dealing with the threat that a virus poses, it leads to some uncomfortable symptoms like a blocked nose and sore throat. Allergies on the other hand, occur when the immune system over reacts to something it comes into contact with. For many people this will be pollen however, other common causes of allergies include animal dander, mould spores and dust mites. When someone is sensitive to one of these things the immune system releases histamine in an attempt to fend them off. This leads to symptoms that are fairly similar to a cold including sneezing and a runny nose. The cold virus is passed on through contact with an infected individual meaning the problem can occur at any time, including in the depths of summer. For the virus to reach you all it takes is for someone with a cold to shake your hand or cough nearby so it’s quite hard to avoid! After contact with a virus it can take a few days for symptoms to arise however, after contact with an allergen symptoms usually begin to emerge immediately. Unlike colds, allergies are not in any way contagious and instead they occur when an individual comes into contact with something they are sensitive to. As I mentioned already, this includes dust mites, mould spores, animal dander and pollen. A sensitivity to grass pollen is most common but tree and weed pollen can also prove problematic for some people. How long does each last? Most people will find that their cold lasts anywhere between two days and two weeks. If yours has persisted longer than this though it’s definitely time to get the issue checked over with your doctor. Although allergies can arise in adulthood, once developed the condition is usually permanent with symptoms reoccurring year after year. However, there may be times where you have no symptoms whilst at others you feel plagued by headaches and blocked ears. That’s because the severity of allergy symptoms fluctuate depending on the amount of pollen, dust, mould and dander (allergens) around you. Many people with a pollen allergy will see their symptoms worsen from March to October for example, when plants begin to pollinate and the hayfever season begins. There is some overlap in terms of the symptoms experienced by cold and allergy sufferers. Although not everyone will experience every one of these issues, colds and allergies usually result in coughing, sneezing, a blocked nose, a runny nose and a sore throat. However, there are also a few symptoms that are only problematic for those with a cold and this includes fever and aching limbs. That’s not all though, as allergens are often in the air around us they can come into direct contact with the body and cause problems like swollen eyes and itchy skin. In contrast, these symptoms are not usually experienced by those with a cold. As there is some similarity in terms of the symptoms experienced by those with a cold and those with an allergy, to some extent they can be dealt with in the same way too. The Sinuforce Nasal Spray for example, works to relieve a blocked nose that allergies and colds can both cause. Also, whether it’s as a result of pollen or a virus, coughing can become problematic and so you may wish to turn to a remedy for this too. Our best product for a chesty cough is Bronchoforce which is made from freshly harvested ivy and thyme. However, there are different types of cough so if yours is more the tickly kind, our Brochosan Pine Cough Syrup is the better product. As both problems are related to the immune system it also makes sense to keep it in good condition. Echinacea is ideal for this purpose as it supports the immune system thus putting you in a better position to fend off viruses and allergens. Our Echinaforce Echinacea Drops are made from freshly harvested Echinacea meaning the plant does not lose any of its valuable properties during production. Although there is a little overlap in terms of the remedies for colds and allergies, there are some differences too. As a cold is a fleeting problem doctors will usually recommend patients get plenty of rest whilst drinking lots of warm honey and lemon tea to help ease some symptoms. In contrast, as allergies are a long term problem, doctors will usually prescribe antihistamines to help counter the troublesome effects of histamine. Here at A.Vogel we also regularly recommend our Pollinosan Hayfever Tablets to deal with the many symptoms of hayfever and allergic rhinitis. These tablets are made from a variety of tropical herbs that make them non -drowsy yet effective. With regular use customers can see an improvement to symptoms like a blocked nose and itchy eyes. For some more information on the treatments for allergies and colds don’t forget you can explore our hubs on both of these areas!